Heart attack. Diabetes. High blood pressure. Stroke. Those are just a few of the scariest words a man can hear from his doctor. And the following six guys heard them all. But instead of accepting a life full of medication and visits to the hospital, they each decided to take their health into their own hands. Now it’s time for you to lose your belly. Here’s how they dropped major kilograms, discovered their strength, and saved their own lives in the process. Looking to lose weight yourself? Meet Coach Trevor Lagerwey. He’s put together the ultimate workout plan to get you ripped this summer. We’ve also got the best nutritionally-sound eating plan for your time and money. All you need to do? Sign up at speedshred.co.za and put in the hard work. In just 12 short weeks you’ll be looking at the dream body you’ve always wanted! After Chris Rodriguez started college, he stopped playing sports and started packing on the kilos. Two years ago, he hit his heaviest weight: 133 kilograms.His diet of heavy, salty, and carby foods caught up to him: Rodriguez had high blood pressure and prediabetes. He knew it was time to make a change, since diabetes has impacted both sides of his family. In October 2015, he signed up for a gym membership. The first day was brutal, he recalls. “I was kind of like a chicken with its head cut off. I went in and just started trying things. I had no real plan. I was just doing a bunch of random exercises.” But then Rodriguez started doing his research and came upon Men’s Health fitness director BJ Gaddour’s Instagram page. “He’s in great shape,” he says. 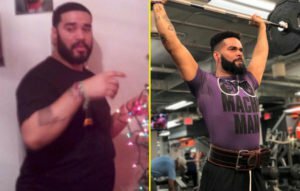 “I started implementing his workouts into my routine, and then I found out that he was overweight as a teenager and it was really inspiring. I told myself ‘If he can do it, I can do it.’” So he kept at it. Even though he worked an overnight job at the time, Rodriguez got himself to the gym nearly every day, mixing things up with cardio and strength training. Growing up, Robert Browne lived and breathed football. But after he fractured his knee toward the end of his junior year in undergrad, he never got to play again. So he became a coach instead, but the injury affected him mentally. He became depressed, lethargic, stopped working out, and ate whatever he wanted. Before he knew it, he was 161 kilograms with “stroke-level high” blood pressure in his mid-20s. Realising he would have to take BP meds for the rest of his life if he didn’t make some changes, Browne stopped making excuses and started lifting strength training with his students. “My job as a health teacher and football coach, we try to tell kids how they need to live, but I wasn’t practicing it myself,” says Browne. That required a crazy amount of pumping iron. Browne spent four days a week lifting heavy with both his football players and powerlifting students, and six days a week of gym time on his own. His cut back on his favourite comfort foods, and loaded up on lean protein, vegetables, and rice to sustain his insane workout schedule. But he also focused on making little changes, like taking the steps instead of the elevator and parking in the back of the lot instead of searching for a spot in the front. At his leanest, Browne cut down to 99 kilograms on a lower-calorie diet, which took him nearly three years. After bulking up for about 8 months, he reached 118 kgs. Now, he’s looking fitter and healthier than ever at 107 kilograms. The failure of his business sent David Clark into the grip of scotch and painkillers. He was 145 kilograms, dangerously prediabetic, and his blood pressure was scary. Clark had tried every kind of diet imaginable: Atkins. South Beach. Paleo. At one point, he ate nothing but canned vegetables. But every time, old habits won out. Then came the wake-up call. “The Hollywood narrative is you crash your car and wake up in jail—and both those things happened to me,” says Clark, of Boulder, Colorado. “But it’s not quite right. You’re ready when you’re ready. I had the final realisation that I was headed to a very early death. We alcoholics call it a moment of clarity.” On August 6, 2005, Clark laced up his running shoes and hit the pavement for just 15 seconds. But he kept at it. 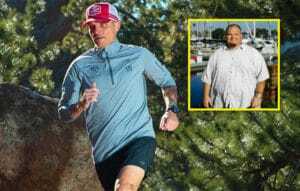 “Every day I had this stupidly simple thing to do,” he says, “and not going for a run, even one day, meant I was giving up.” In 3 months he dropped 23 kilograms and tried a local 5K run. He also swore off anything that would cause blood sugar spikes. Fruits and vegetables were in, along with eggs, cheese, and lean cold meats. (Now he’s vegan.) 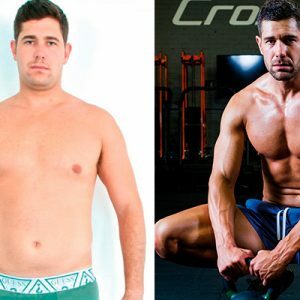 In only 15 months, Clark shed half his body weight to reach 73 kilograms. Today, the 45-year-old is an ultramarathoner. It was a type 2 diabetes diagnosis in November 2011 that prompted Karl Kay to make a change. At the time, Kay, a print and design manager in Lincoln, England, was nearing his 50th birthday. His weight hovered around 109 kilograms. 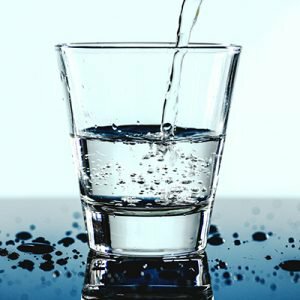 Not thrilled about facing a life of insulin injections and an elevated risk for heart attack, stroke, and other health problems, Kay took action. 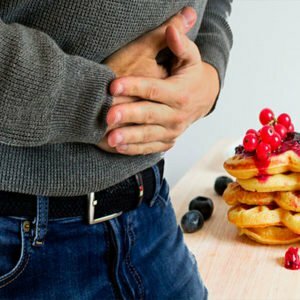 He had read about a study that found that people could reverse their diabetes by going on a low calorie, low-carb diet, and he decided to do the same. That study has been backed up with newer research. 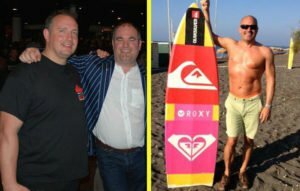 Kay started his ultra-low-carb diet in December, and dropped 14 kilograms by late January. Over the next year, he lost another 9 and started strength training. By February 2012, his blood sugar levels were normal—and have stayed that way ever since. Now 52, Kay is fitter than ever, back to playing sports competitively, and has reclaimed the beach body he had at 25. A sedentary life blew Eric O’Grey up to 154 kilograms. 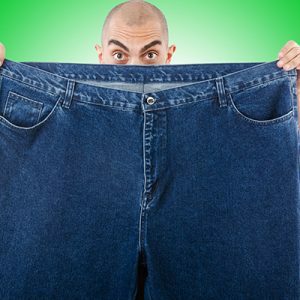 He had a 132 cm waist and spent R13 300 a month on diabetes and blood pressure meds. Dinner was not one, but two XL pizzas. The 56-year-old marketing manager experienced a wake-up call on an airplane, of all places. As flight attendants tried to find him a seatbelt extender, the guy next to him grumbled in disgust, “I’m gonna miss my connection because you’re too fat.” O’Grey scheduled bariatric surgery, but a naturopathic doctor suggested an alternative: A canine companion. So, he went to a shelter and adopted Peety—also middle-aged and obese. They went for two 30-minute walks per day, gradually adding distance and speed. He also learned to cook and make smoothies. The weight melted off— 1 or 2 kilograms a week. 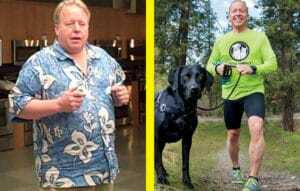 “It wasn’t anything extreme, just light to moderate exercise and diet,” he says. In 10 months, O’Grey had hit his goal weight of 82 kilograms. And after Peety passed away, he rescued another dog, Jake. They run 64 to 74 kilometres a week together and O’Grey has run 15 marathons. 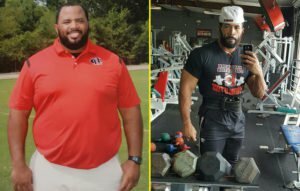 Kyle Brown-Latham’s weight fluctuated his entire life. 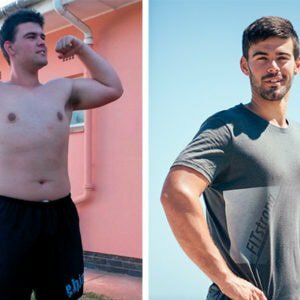 One yo-yo diet and weight loss pill after another left him feeling heavier than ever—but after an accident left him nearly crippled at the age of 30, Latham ballooned up an extra 43 kilograms in just four months. He suffered a double blowout to his knee and twisted his spine, herniating three discs and fracturing a vertebrae. The only way he could cope was through food. He ate whatever he wanted and couldn’t do his physical therapy correctly because his back pain was too much to bear. Every single movement required effort and he could feel his health deteriorating. In January 2015, Latham and his husband started by cleaning out their entire kitchen of junk foods. He also cut out his biggest vice: sugar. Then he began dragging himself to the gym. The first week he only went for 10 minutes at a time, and then he slowly worked up to longer sessions. Fast forward a couple of months, and he was up to an hour. He made friends with the guys he saw working out every day and asked them about their diets and exercise routines. In the past four months, Latham has finally worked up to strength training. He now spends an hour and a half in the gym every morning 5 to 6 days a week. 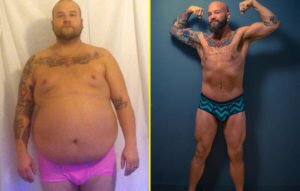 After getting his excess skin surgically removed, he can finally show off a set of abs at 89 kilograms after two years of hard work. Now he craves the gym instead of soda, his energy levels are through the roof, his relationship is better than ever, and he’s never felt happier.